This is a slideshow showing a vision for Manchester as an Ambient Learning City. This is explained in the slideshow narrative as a technological view of how Manchester can become a smart city. In agricultural areas there are lots of high quality products made in the region (vegetables, food, etc). Very often there is a lack of knowledge of how to work with these products in a professional way. Additionally there is a lack of awareness within the people but also special offers for the local gastronomy are missing. The Beyond the School project offers a simple, yet exciting, way in which to capture, share and celebrate this rich local heritage. There are more than 200 schools and other organizations and more then 1.000 students from 7 EU countries (UK, DE, CZ, SK, HU, PL, RO) already take part in Beyond the School project. 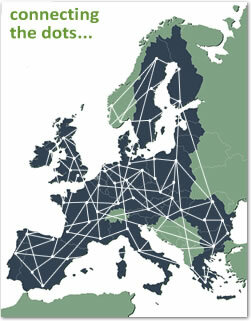 They have created a great database of local projects from wide range of place in Europe. The focus is on the business models and measures for commercialization that can be of relevance to design, produce and make available more market oriented local learning systems as a professional service for villages and local communities. Il circolo di studio è una modalità di aggregazione spontanea di persone che desiderano approfondire un argomento e non trovano il corso di formazione adatto a soddisfare questo bisogno. L'esperienza dei circoli di studio in Provincia di Massa Carrara è andata sempre più consolidandosi. Per Circolo di Studio si intende quindi un piccolo gruppo di cittadini che spontaneamente si riuniscono intorno ad interessi comuni al fine di gestire autonomamente, ma in maniera riflessiva, un proprio percorso di apprendimento. The CLEM project will aim at: establishing three clusters in the project regions. While our partners in western European countries have profoundly more experience in working with clusters, few educational programs exist that support development of competencies needed to launch, sustain and develop clusters. This project description outlines a a national scheme to train and support community learning champions and demonstrates how modest amounts of funding can help transform the lives of learners and build communities’ capacity for positive change. It refers to the appointment of local Champions - people who are respected and active in the community, town or city, and describes their role in building up community spirit and active citizenship. Creative Cities is an European project within the Central Europe Programme that foresees cooperation between five Central European cities: Leipzig (DE), Genoa (IT), Gdansk (PL), Ljubljana (SI) and Pecs (HU). The project specifically addresses creative industries that are defined as “those industries which have their origin in individual creativity, skill and talent and which have a potential for wealth and job creation through the generation and exploitation of intellectual property.” (UK Department of Culture, Media and Sport 2001). Creative Cities is a British Council project, set up in 2008. The project was developed in 15 countries across Europe. It provides a platform and a toolkit which can be used by individuals and organisations wherever you may be. Activities are now run largely independently of the British Council, but we continue to maintain this website and to co-ordinate use of the Future City Game and Urban Ideas Bakery. Jihomoravský kraj, Zlínský kraj and Moravskoslezský kraj in the Czech Republic. The European Commission approved a Cross-border Cooperation Operational Programme between Poland and Slovakia for the period 2007-2013. The Programme involves providing Community support as part of the European Regional Development Fund (ERDF) for specific Polish and Slovakian regions that lie along their common border: Bielsko-Bialski, Nowosądecki and Krośnieńsko-Przemyski, Žilinský kraj and Prešovský kraj.